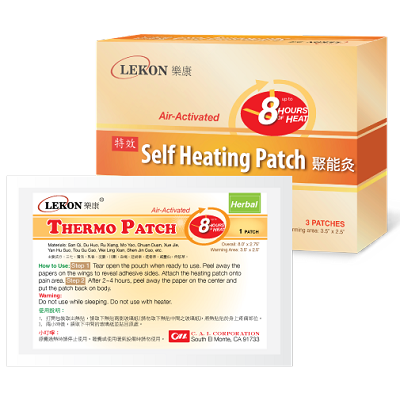 is a kind of Air-Activated Self Heating Patch. It has such functioning as following: Fast and long lasting (12-16 hours) pain relieve for common aches and pains such as neck and back pain, hip and leg pain, muscle spasms, joints pain, sports injury pain, arthritis or bursitis pain, shoulder-arm discomfort and strained muscle pain. Tear open pouch when ready to use. It may take up to 10 minutes for Lekon Warming Care reaching its peak temperature. Peel away paper to reveal adhesive sides. Place on pain area with adhesive tape against the skin. Please check skin frequently during use. If you find irritation or feel a burning sensation, remove the patch immediately. use for adults over 18 years old. Do not use when sleep. Do not use for persons with fever or skin damage. Do not use on children or pregnent women. Do not use if the package is damaged. Put closed package in a dry area and avoid direct sunshine. 1 Patch/Bag x 4 Bags/Box. Feature: Buy 10 Get 1 Free!